Around the time I began teaching at Berry College in Fall of 2014, I also began writing a method book. My goal when starting this book was to create a method of learning and visualizing the note layout across the fretboard, and to approach it from a variety of directions to help readers reach a greater fretboard fluency. I found the CAGED System as a great place to start, and ultimately decided to dedicate this book towards the full utilization of that system, with future book(s) dedicated to other systems and methods of learning the fretboard. I finally finished writing the book only 3 hours shy of the year 2016. It went into the review and editing phase at the early part of this year, and I am thrilled to say it is now complete and available to the public. It can be purchased through the Lulu.com link above. 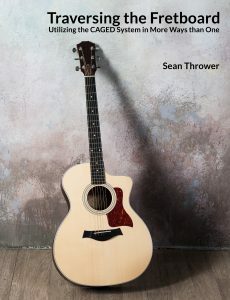 “Traversing the Fretboard is designed to help guitarists of all levels and styles of playing strengthen their understanding of how notes are organized across the fretboard. This method uses the CAGED System to build and demonstrate a connection between chord shapes and scale patterns. It also shows how the CAGED System can act as the foundation for forming seventh chords, finding and playing open and closed voicings, and discussing music theory. Along the way, there are many engaging musical examples from a variety of genres to offer a diverse application of the ideas discussed in each chapter.